We know you have questions. We hope you find these answers to inquiries from other applicants helpful. I plan to attend graduate school in Economics. How should I prepare? If you are considering a graduate program, review these tips. What are the career opportunities with a major in Economics? The discipline focuses on the allocation of resources, which is applicable to many professional pipelines. Where can I find information related to graduate programs? Visit the pre-professional advisor at the Student Academic Success Center, or SASC, located in 111 South Hall. Can I double major in Economics and Managerial Economics? Unfortunately, a double major cannot be pursued at this time; however a major and minor combination is certainly possible. These programs exceed the maximum unit overlap allowed between major programs. Exceptions can be petitioned through the College of Letters and Science's Undergraduate Education Advising Office. Can I major in Economics and minor in Managerial Economics? Yes. Visit both departments to meet with undergraduate academic advisors for more information. What do I need to declare a double major? Petitions can now be submitted online through the myUCDavis student portal. What do I need to declare a major in Economics? You will need to be in good academic standing as well as have an overall GPA of 2.0 and an upper division GPA of 2.0 (if applicable) for the major. I am trying to enroll in upper division ECN courses during Pass 1 but Schedule Builder does not allow me to. What can I do? In order to enroll in upper division courses, you must have completed 90 or more units and be declared in Economics. The only exception to the major restriction is ECN100A, 100B and ECN101. You must be a declared Economics student during Pass 1 to register for upper division Economics courses. All restrictions will be lifted during Pass 2, at which time you will be able to register and/or be added to the wait list for upper division Economics courses. What courses should I take after STA13 and ECN102? 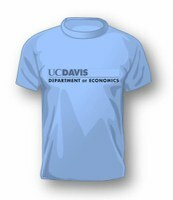 Economics 190 (Topics in Economics) will include at least one more advanced econometrics course, beginning 2018-19. Currently ECN 132 (Health Economics) and ECN 145 (Transportation Economics). More courses may be added over time. ECS 10 (Introduction to Programming). Programming in Python. ECS 30 (Programming and problem solving). Programming in C.
ECS 116 (Data bases for non-majors). Relational databases. SQL. MAT 25 (Advanced Calculus). Require 21C. Can ARE 142, 143, or 144 count for the Economics major? Unfortunately, these courses are not allowed for credit toward the Economics major. Only the following ARE coursers may be used toward degree credit: 115A, 115B, 139, 156, 166, 171A, 175 and 176. For more information, please meet with an Economics advisor. I have not taken ECN100A, 100B or 101 yet. Can I take other upper division ECN courses? I need to choose 12 units of elective courses in Economics. What courses can be applied toward this requirement? Any upper division Economics course can be used toward your elective requirements. If I take a course at another institution, how can I get this course approved for use toward Economics requirements? If you take a course at the community college in California, you can use ASSIST to determine articulation. It is also recommended that you review the Economics course archive. Should I take ECN100A and ECN 100B before ECN101? The order in which you complete these core courses is not critical. Should I take MAT16 or MAT21 series? If you plan to attend graduate school in Economics or business, the MAT21 series is highly suggested. For students who plan to go directly into the workforce, the MAT16 series is appropriate. What is the difference between ECN162 and ECN160A-B? ECN162: International Economic Relations is intended for non-majors, and summarizes both ECN160A-B. Economics majors can take ECN162 for full credit but should not take ECN160A-B because only 2 units of credit will be granted for ECN160A-B. If you take ECN160A-B before ECN162, you will not receive credit for ECN162. Will I be able to get into a waitlisted Economics course? There is a great deal of movement on waitlists in the first week of classes. However, faculty cannot guarantee you a spot in the course as our department does not issue permission to add or "PTA" codes. There would have to be other students choosing to drop the course in order for you to be added. Our advice would be to attend the class for the week as well as a back up course. If you are not in the course by the end of a full week of classes then you should give up and try again another quarter.